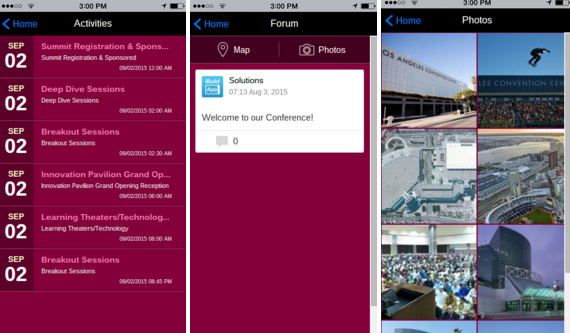 Wouldn't it be nice to keep attendees, employees, speakers and other people informed about the conference events with the device that most folks have in their pockets? 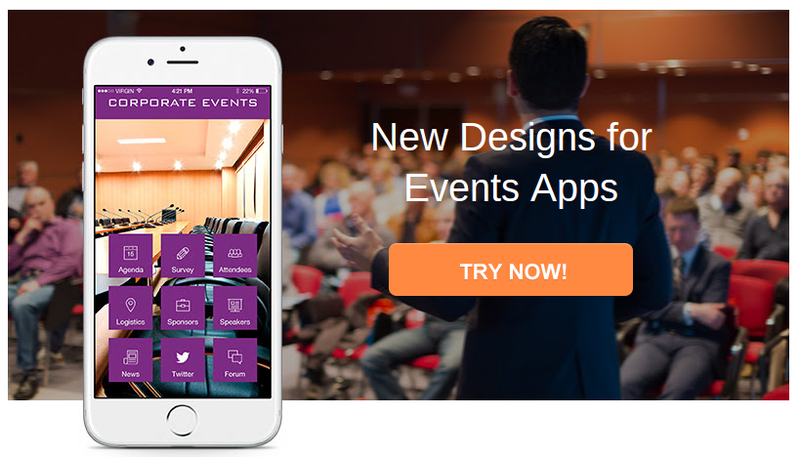 If you've ever been to a conference or event that utilized a mobile app, you already know how convenient it can be to access an app for driving to the event, keeping up with the schedule and checking in on the speakers. 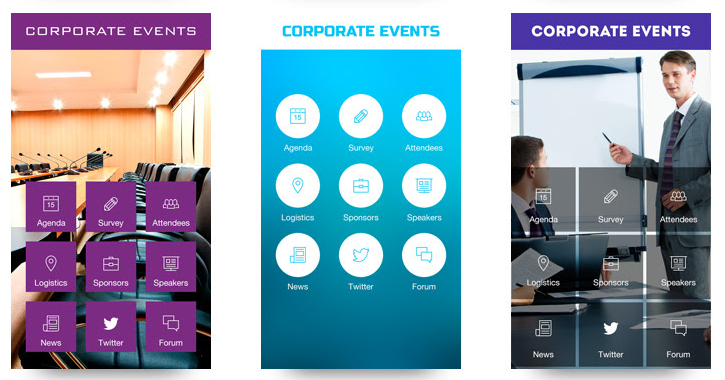 That's why iBuildApp has created a wonderful section in the template store dedicated just to corporate events and conferences. 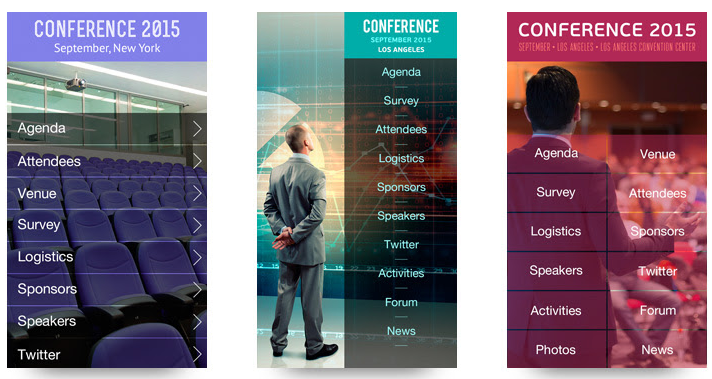 The goal with our conference and event templates is to make them professional and easy to use. Therefore, you'll find a wide range of colors, buttons and navigation options, but they all provide wonderful stock images and preset pages that you can fill in with your own information. With a conference or event, visitors need to know exactly where they must drive so they don't get lost. A pre-built Venue page has options for including contact information, addresses, hotel names and images. In addition, you can collect feedback from attendees by editing the provided Survey page, filled with personal information fields, radio buttons and questions. It's also nice to show potential visitors who else is planning to come to the event. 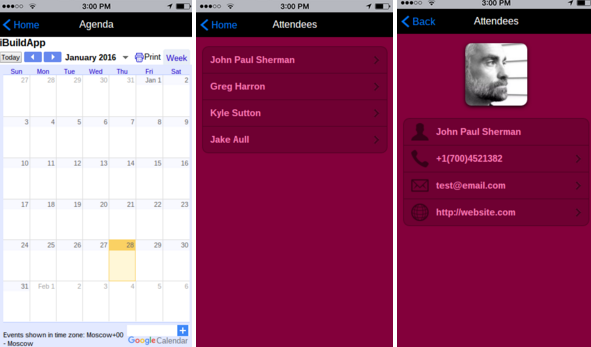 Make a list of your attendees, and incorporate pages with names, contact information and websites. 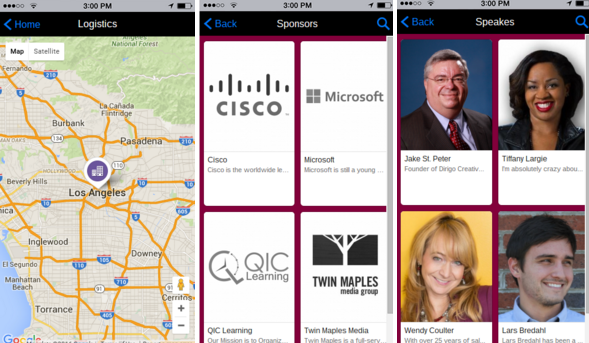 The goal is to reveal attendees that other potential attendees might want to speak with. How are attendees going to get to the event? That's easy, because the event and conference templates offer pages that include maps and contact information, so everyone can simply punch in their own address to get directions to the facility. Finally, a Photos page is offered for you to upload images of past events, the hotels, airports and surrounding attractions. This may seem like a fluff page, but photos are essential in getting people excited about the trip. For example, if you're in a warm weather climate, you can really get people amped up by posting sunny beaches and fun attractions. 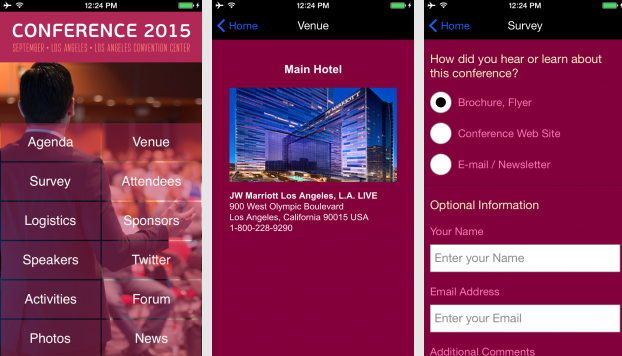 Now that you've had a chance to see what the event and conference templates can do for your company, feel free to click the button above to play around with the features and understand how easy it is to make your own conference app.